#988 under repair, July 14, 2002. Milwaukee Road #988 was built by the American Locomotive Co. at Schenectady, New York in January of 1947 (serial #75135). It is a model RSC-2, weighing 117 tons on six axles. Four axles arepowered and two are idlers to distribute weight. The Alco V-12, model 244 diesel engine develops 1500 horsepower and is equipped with 6-BLC brakes. The electrical system is General Electric. In November 1946, the Milwaukee Road took delivery of 18 model RSC-2 roadswitchers from Alco. The #988 was thelast freight unit built. “RSC-2” stands for Road Switcher C-type trucks. On the A-1-A trucks, the two end axles are powered by GE 752 traction motors, while the center axle is unpowered but spreads out the weight. This design made the locomotive ideal for lighter weight rail (60 lb. 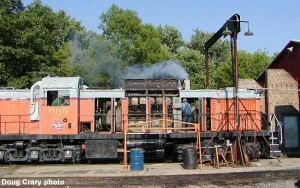 or lighter), such as is found on Mid-Continent’s line. In all other respects, the engine is similar to Alco’s RS-2 model. #988 at North Freedom, Autumn Color 1989; Jim Neubauer photo. The Milwaukee assigned the new diesels to the Wisconsin Valley Division, at Wausau, Wisconsin to study the effects of an all-diesel division. 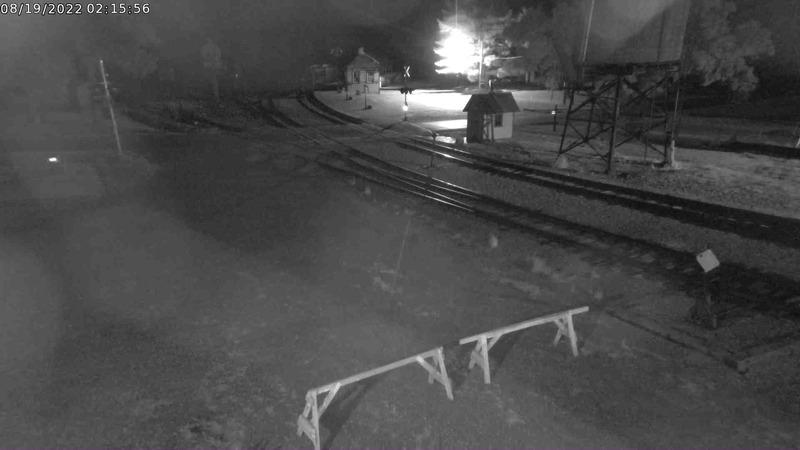 By the summer of 1947, all steam was gone from the Valley. 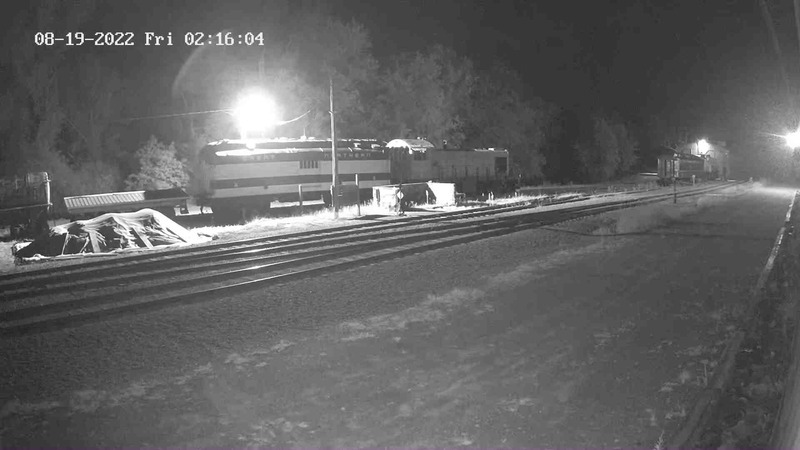 The #988 was soon transferred to the Iowa & Dakota Division. 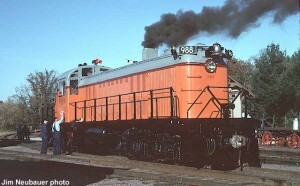 There it received the simplified Milwaukee orange and black paint scheme, and was re-numbered to #594 in 1959. In the early 1960’s, the #594 was reassigned to La Crosse, Wisconsin as the La Crosse switch engine, making an occasional sidetrip to Winona, MN or Viroqua, WI. By the early 1970’s, most of the older Alco’s were shut down and scrapped. But as late as June 1976, the #594 was still holding the afternoon switch in La Crosse. #594 escaped the scrappers torch when it was purchased by the Kettle Morain Scenic Railway in 1976. The KMSR renumbered the engine #4. It was soon sold to Trans-Northern Inc. TN renumbered the unit back to #988. TN used the #988 on several of their shortline operations until early 1981, when it was shut down and stored on the Escanaba & Lake Superior. In late October 1985, a group of Mid-Continent members purchased #988 from TN. The engine arrived at North Freedom on January 3, 1986, and was used for the first time at Snow Train 1986. #988 has been painted back to its original 1947 paint scheme. Not many RSC-2’s remain today. Mid-Continent volunteers are making repairs to #988’s intercooler and several cylinder liners that were responsible for its removal from museum train service. It is also undergoing replacement of its traction motors as a result of damage sustained during record flooding of the museum property in June 2008.